The choice of bearings can determine how well a product meets customer needs. By extension then, company reputation rests on how well those rotating elements do their job. It's not just about speed, load and temperature either. Size, durability, friction, noise and ease of installation are just some of the additional factors that affect not just performance, but also overall cost. When a bearing is needed, a design engineer's first instinct is often to reach for the product catalog. Yes, the design will be compromised, and performance affected, but isn't it cheaper and quicker than procuring custom bearing assemblies? Actually, no, it isn't. To put it simply, a custom bearing will do exactly the job required. Anything else is either over-specified, which means paying for unneeded capabilities, or under-specified, which could lead to premature in-service failure. What's more, by eliminating long supply chains and extended testing, a custom bearing can even mean shorter time-to-market and lower costs. Catalog bearings come in standard sizes that rarely suit the space available. That leaves the designer with a choice of either creating more room or using a bearing that may not have all the functionality needed. The alternative is to talk to a manufacturer of custom bearings. Once provided a thorough understanding of the requirements, specialist bearings engineers can usually create a custom product that fits without making the product larger, heavier and more expensive. Sometimes it's even possible to improve the product in ways the designer didn't expect, perhaps by incorporating additional features or changing the materials used. 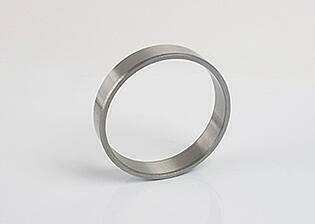 For example, many standard bearings are made from 52100/GCr15 material. Switching to a specialty grade material, for instance which has higher load bearing capability, may allow the use of smaller or thinner races. Perhaps if warranted due to environmental or chemical exposure, specialty stainless steel materials might be more advantageous. In some applications it's essential that the bearings produce as little noise as possible. For others, low friction might be the priority, or protection against aggressive cleaning agents. In developing a custom bearing, the engineering team can consider these requirements from the start. That's almost always a lower cost approach than trying to locate a standard product with those characteristics. Engineers who take the time to find and talk with a manufacturer of custom bearings are often surprised by the ideas this can yield. An understanding of the bearing's role in the product may lead to ideas that simplify installation and assembly. It might also be possible to reduce loads or add protection against contamination, and in doing so increasing product life and burnishing the product manufacturer's reputation. Engineers designing complex products for demanding customers strive to maximize performance and minimize cost. Standard or catalog components are not going to help meet these goals: they require too many tradeoffs and compromises. There's even the possibility they'll negatively impact performance and impact sales. Bearings provide smooth, low friction, low noise motion. As such, it's essential to incorporate the best bearings for the application. The starting point is to talk with a manufacturer of custom bearings. For over 8 decades, Hartford Technologies has produced high quality rolling elements like bearing assemblies, precision pins and balls, and shafts and rollers. Certification to the ISO 9001, ISO/TS 16949 and ISO 14001 standards demonstrates commitment to formal systems while investment in state-of-the-art inspection equipment ensures consistent product quality. The reason customers keep coming back to Hartford is because they get exactly what they expect and need. To learn more we invite you to contact us today.